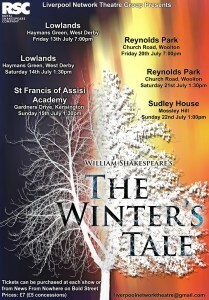 The Story of two Kings, Leontes and Polixenes, and two lands, Sicilia and Bohemia. Leontes of Sicilia imprisons his Queen Hermione and orders the death of his newborn child when he is convinced that Hermione has had an affair with the visiting King Polixenes of Bohemia. The newborn is instead taken in secret to Bohemia and rescued and raised by a Shepherdess. 16 years later in Bohemia, the baby has blossomed into the beautiful Perdita, with whom Prince Florizel, son of Polixenes, falls in love. No one knows Perdita’s true origins so Polixenes is not happy when he discovers his only son wishes to marry the daughter of a Shepherd! Florizel and Perdita escape to Sicilia, where Perdita’s true identity is revealed and her family reunited. 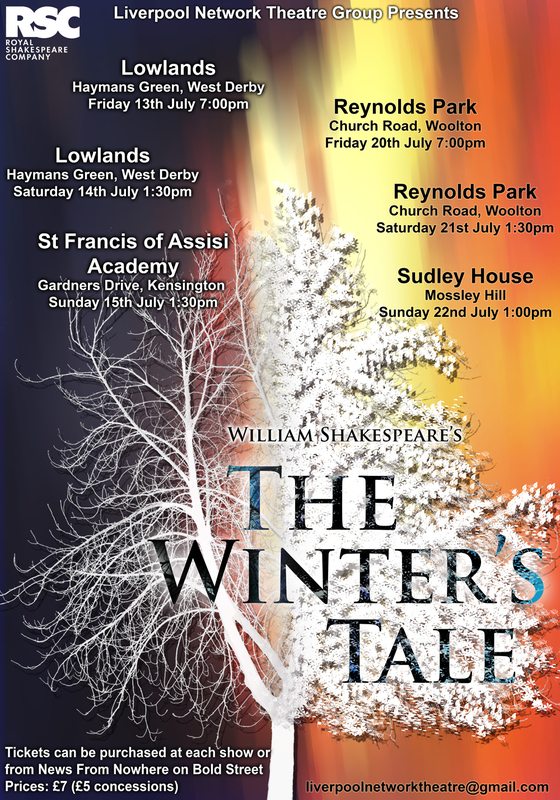 Directed by Andy Kerr and Margaret Marshment, The Winter’s Tale was performed on the 13th and 14th July at Lowlands, West Derby; the 15th July at St. Francis of Assisi Academy, Kensington; the 20th and 21st of July at Reynolds Park, Woolton; and the 22nd of July at Sudley House, Mossley Hill. It starred Demian Stimson, Claire Rogers, Natalie Dowdeswell, Mike Leane, Frank Kennedy, Faye Christianson, Anne Rock, Darren Jones, Sean Jhooty, Kevin Foott, Geraldine Moloney-Judge, Peter Harris, Dave Clayton, Lisa Perry, Sonia Chapman, Paul Tallant, James Gray, Stewart McDonald and Matt Davies.